It has been brought to my attention that the Atwater library has an interest in targeting this specific population. Young people particulary are often online, engaged with online culture. The Atwater Library has a useful and informative website that can be easily accessed from any location with the internet. This scavenger hunt attempts to engage while also challenge people into getting to know their neighbourhood library a little better. At this point, I present a rough draft. After receiving feedback I can potentially take this scavenger hunt and revise it. On a sub-level, I challenge my colleagues to take this scavenger hunt and see how much we really know about the Atwater Library. This is a response to the initial disconnect I felt, and my attempt at getting connected. As we are closing in on the early parts of development, I think it would be beneficial to participate. From that point we can better understand our actions and goals. 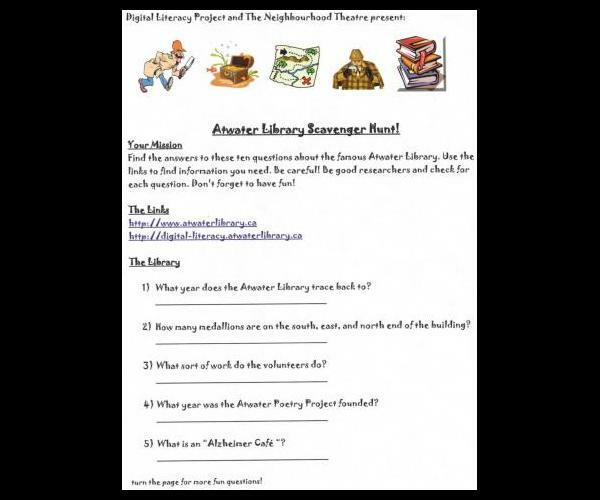 I Invite you to take a scavenger hunt and get acquainted with the Atwater Library!